You wouldn’t know it from the unseasonably warm weather we’re having here in Kennebunkport, but Fall is just around the corner. The official Maine Fall Foliage people are expecting these warm temperatures to extend the colors into late October. Good news if you want to squeeze a last minute holiday in before winter hits! Fall is one of our favorite seasons here along the Southern Maine coast. I love the crisp air at night, a welcome relief after a hot and humid summer. We throw open the windows and let the cool breeze in. It’s perfect sleeping weather. There’s something about the light in the autumn too that I particularly like. I’m not a photographer (I’m sure they could explain it), but it’s warmer and softer, sitting lower on the horizon. In addition to all of the wonderful colors on display, fall also means pick your own farm shops, and we have some great ones near our Bed and Breakfast for you to explore. Enjoy wandering the fields, eating fresh crisp apples and load up on locally grown Maine fresh produce as you do. Patten’s Farm is our neighbor (just down the road on North Street here in Kennebunkport). I buy a lot of my fresh fruit and vegetables from this fruit shop all summer long as they have really good locally grown produce. Their farm is in Gorham, Maine on Route 22, about a 20 minute drive from the Inn. 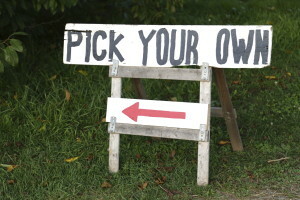 Visit the farm for pick your own pumpkins. A little further away, but a great drive for leaf peepers, is one of our favorite orchards. Randall Orchards in Standish, ME are open seven days a week from 9am – 5pm through mid-November. They’ve got a wide variety of apples in the orchards, including standards like Golden Delicious, Jonathan and McIntosh. 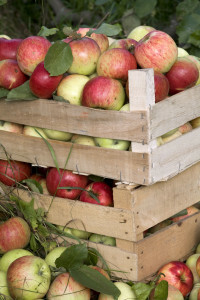 They’ve also got some lesser known varieties such as the classic Jonared, and Nodheads, a delicious sweet eating apple that’s also particularly good for making cider. And yes, they do have a working cider mill on site too. You can also pick pumpkins, gourds and a variety of squash from September through October. If you want to combine seeing the Lighthouses in South Portland’s Cape Elizabeth with your farm shopping, Alewive’s Brook Farm is a family run farm not far from the Two Lights. Although not organic, they do minimize their use of chemicals and pesticides. This beautiful farm is open year around and in addition to pick your own fruit and vegetables, they have a farm shop that sells farm fresh produce, fresh eggs, lobster and seafood. You can even get your Thanksgiving turkey from them! The Spillers have been farming in Wells, Maine since 1894. 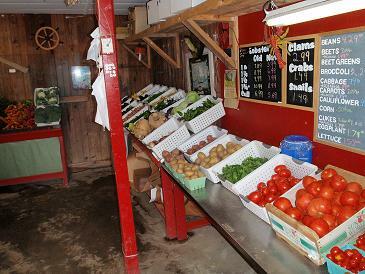 The Spiller’s Farm Store is located a short distance from Route 1 and is also open year around. Both pumpkin and apple picking are available through October. If you find yourself at this farm on a weekend in October, you can take a 30 minute hayride to see the fields, wild turkeys and their cows. It’s a fun day out for the whole family. The snow will be falling soon enough, but lots of time yet to enjoy the sights and tastes of Kennebunkport! We hope to see you this fall. This entry was posted in Food, General, Local Information by 1802House. Bookmark the permalink.